Two components of the Starling equation relate transcapillary fluid flow to the number and size of capillary pores that are available for fluid exchange: Kf and a. The filtration coefficient, expressed as milliliters per minute per mm Hg, is an index of the capacity of a membrane to transport water for a 1-mm Hg pressure gradient across that membrane. In tissues, Kf (LpS) is determined by the number and size of pores in endothelial cells of each capillary (Lp) as well as by the number of perfused capillaries (S). Hence, any condition that results in either an increased capillary permeability (increased pore size), an increased number of perfused capillaries, or both will lead to an elevated rate of transcapillary fluid flow. The capillary reflection coefficient (a) is a membrane parameter that describes the fraction of plasma and interstitial oncotic pressures transmitted across the capillary wall. When plasma proteins are too large to permeate (100% reflection) the capillary pores (e.g., blood-brain barrier), a is 1.0, whereas a is equal to 0 when proteins penetrate and cross the pores as easily as water. 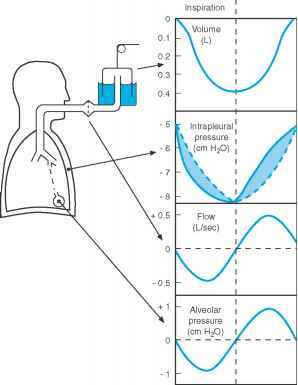 If capillary permeability is increased, a falls and the effectiveness of nc and in influencing the rate of capillary fluid flow is diminished. The values for Kf and a differ considerably between tissues. Organs (liver, spleen) perfused by capillaries of the discontinuous (sinusoidal) type generally exhibit the highest values for Kf and the lowest values for a, indicating that the very large interendothelial clefts in these capillaries can sustain high fluxes of both water and proteins. On the opposite end of the capillary permeability spectrum are the organs (muscle, lung) perfused by continuous capillaries, which tend to exhibit much lower values for Kf and higher values for a, with the brain representing the extreme case in this group. The substantial differences in Kf that are noted between some organs in this group, such as skeletal muscle versus lung, are largely due to corresponding differences in capillary density, rather than permeability (pore size). In all organs, there appears to be a gradient in Kf that increases progressively from arterial to venous ends of the capillary. A number of physiologic and pathologic conditions are associated with changes in Kf and/or a. For example, the capillary recruitment (increased number of perfused capillaries) that occurs in exercising skeletal muscle leads to an increased Kf and a corresponding increase in capillary filtration. Ingestion of a lipid meal appears to affect both Kf and a in capillaries of the intestinal mucosa. The meal-initiated rise in Kf and fall in a suggest that there is an increased number of perfused capillaries (Kf) as well as an increased capillary permeability, which may serve to facilitate the entry of newly absorbed lipids into the blood and lymph circulations. Inflammatory conditions are known to be associated with the release of vasoactive agents that can profoundly increase both capillary permeability (decrease a) and perfused capillary density (increase Kf), with a resultant enhancement of capillary fluid filtration that often leads to interstitial edema.